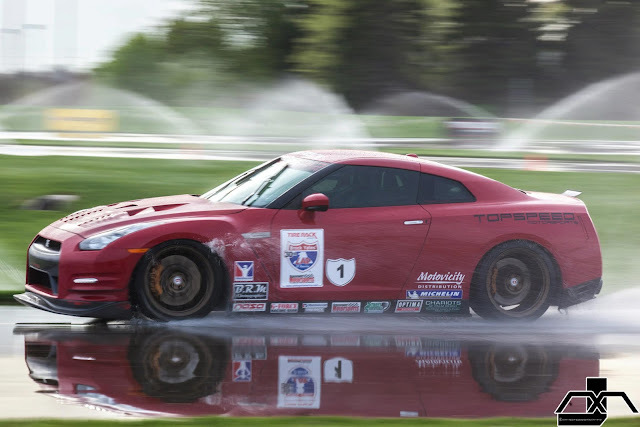 TopSpeed Motorsports Nissan GT-R on the wet skid pad Day 1. Three events at VIR on day6 of the One Lap of America. Day 6 has three events at Virginia International Raceway. VIR #1 is complete and suprise, suprise TSM is at the top of the charts. Followed very closely by the Tangerine Associates/Forged Performance Nissan GT-R of Catesby Jones, and William Taylor. GT-R's 1,2,5,6,7,8, and 9. 2013 TSM GTR PRO EIGHT "OLOA EDITION"
VIR #2 and #3 coming up soon. VIR #3. Can you guess who took the top spot again? GT-R's at 1,2,5,8,9 and 15. Overall after 6 days of the One Lap the overall leaders are still the team from Top Speed Motorsports in their Nissan GT-R. In second place is the PREFIX/Forge Ahead Dodge Viper, followed closely by the Tangerine Associates Nissan GT-R just 10 points behind. 4,5,6, and 9th spots are all occupied by Nissan GT-R's.